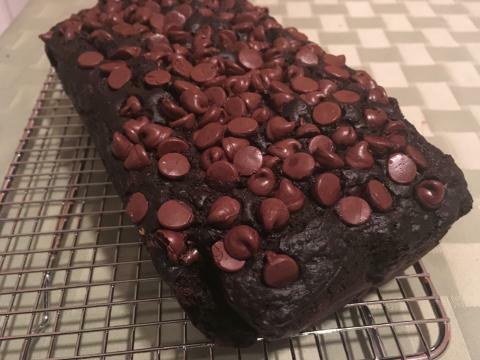 I like banana bread, but I may never go back to the plain old version after making this double chocolate banana bread. Recommended by my sister-in-law, this recipe turns out a moist, rich and incredibly chocolatey quick bread. Sure, it resembles a brownie or slice of chocolate cake. Really, it essentially is dessert. But with the bananas in it, I didn’t think too long before I was slicing it up for breakfast. Everything in moderation, as they say. The bread is incredibly chocolatey, but the bananas can compete with it. As my nine-year-old said, “I can taste the banana in it, but it’s not BAM in your face banana.” I wholeheartedly agree. Preheat your oven to 350 degrees. Spray a loaf pan with non-stick spray and line it with parchment paper. 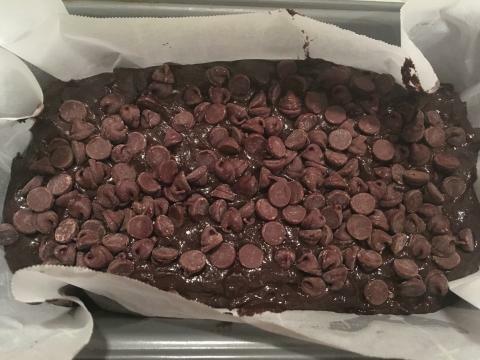 Top the batter with the remaining half cup of chocolate chips. Press them down gently into the top of the loaf. Bake for about 70 minutes. It’s done when a toothpick placed in the center of the loaf comes out clean. It’s best if you let the bread cool before you cut it (if you can wait that long! ).